Nancy Blumenti, 6, of Mrs. Elizabeth Dragovich's A-1 class, Leland Street School, San Pedro, in May festival costumes. 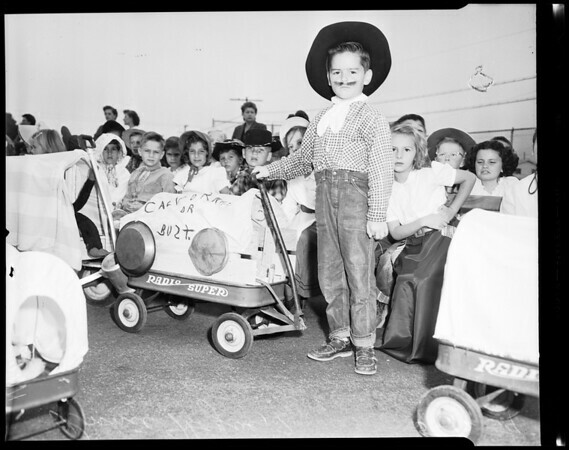 1: Ronnie Hogue 7, in Covered Wagon costum [sic] holds wagon tongue in front of A-2 Class of Mrs. Flossie M. Clayson. 8: Ronnie Hogue, 7, same as above. 9: Pony Express riders pass parents stand in Leland Street School May festival. 10 same as 9. 11/12: Indian dancers at Leland Street School May festival".